Bergold Peter J. Treatment of traumatic brain injury with anti-inflammatory drugs. Experimental Neurology 275 (Pt 3) (2016) 367-380. FULL-TEXT. Note added in July 2016: A related article, entitled “Perispinal Delivery of CNS Drugs: From Corning to Perispinal Etanercept”, published on July 9, 2016, on the Brain Immune Trends website, accessible by clicking here. 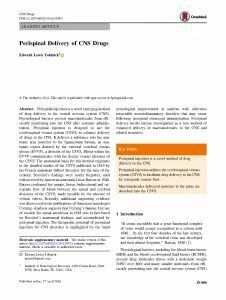 Perispinal Delivery of CNS Drugs. Edward Tobinick MD. CNS Drugs. 2016;30(6):469-80. do:10.1007/s40263-016-0339-2, published online 27 April 2016. (Download free full-text PDF).